Third Avenue creates a contextually responsive solution that balances three key design principles: maximising natural light and ventilation, creating functional open spaces, and controlling privacy. 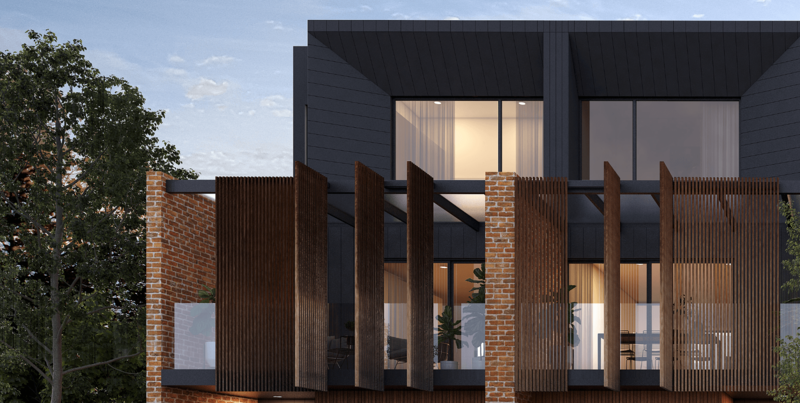 Sympathetic to the surrounds in its design, each style of home has been consciously created to showcase diversity in the newly created streetscape of Third Avenue, and, regardless of which home is yours, the focus is on practical living. "The key to unlocking the potential of any site is through a rigorous interrogation of its context. That, coupled with a solid framework in design clarity, has resulted in the master-planned approach for Third Avenue." – Andrew Steele, Director, Studio Nine. Each home complements the newly created streetscape of Third Avenue, with a strong focus on space and light no matter which home you choose. Each home has three bedrooms, featuring large, functional spaces with distinct areas for cooking, dining, living and sleeping. Outdoor spaces have been a huge consideration in Third Avenue, with stylish landscape and maximised green space to create seamless indoor-outdoor living and a sense of space and freedom, not always expected in inner-metro living. Homes have generous private gardens and balconies, with minimum outdoor spaces of 17sqm to just over 60sqm overlooking Brownhill Creek. The way in which each home interacts with the surrounding neighbourhood has been carefully considered. Where possible, traditional materials have been used so that these homes sit well in their surrounds. We have incorporated earthy materials like brick and timber alongside more urban materials like perforated steel, to create a robust, high-quality finish, balanced by delicate design features that maximise space and light. The Ash and Elm Terraces are designed to interlock, creating an interesting architectural definition between homes. The fanned architecture of the Linden Residences enables the homes to follow the natural arc of Brownhill Creek and step each home back from its neighbour. The distinct entrances of the Torrens Titled Birch Release, personalise the residence for each owner. Our architect's focus on style and quality ensures that Third Avenue’s interior specification matches the stunning exterior. A full-service architect, experienced in both project architecture and interior architecture, allows Third Avenue to deliver on the primary principle of a ‘considered’ design – this is the basis of Third Avenue. This creates internal spaces that feel connected to the exterior surrounds, yet private, and individual floorplans consider how you enjoy your home, rather than simply being “a place to live”. The bedrooms are generous (all with built-in robes) and windows are strategically placed to maximise light while maintaining privacy. Owners of the Birch Release and Linden Residences can enjoy a master suite, which includes a walk-in robe and ensuite. The bathrooms maximise storage and functionality with clever details like a shower niche, wall-mounted tapware and the sophistication of full-height frameless shower screens. Combining stylish design with practicality, every kitchen has double sinks, a gas cooktop, and abundant circulation space. All homes have an island bench with generous space for people to gather and entertain. Storage is maximised and includes wide, deep drawers, double-width pantries, feature open display shelving, ample room for double-door fridge/freezers and benchtop space for food preparation. The homes have generous laundry rooms with cupboards for additional storage. All these factors combine to create a living environment that is as functional as it is beautiful.